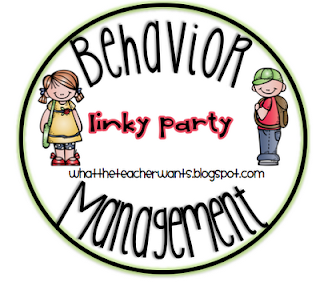 I have posted before about my "Secret Student" before but I am posting about it again to include in in What the Teacher Wants Behavior Management Linky Party! Get over there and get yourself some good ideas! These last few weeks have been hectic and crazy. The kids in my class have been real troopers through it all. We went from three first grades to two first grades after the first two days of school. Yeah, that was interesting to say the least and I think we are all finally getting into the groove of things! We added some more friends, moved some tables around and crammed ourselves in nice and cozy! I am always looking for ways to bribe promote good behavior. We give Eagle Feathers out at our school and in first grade we keep them in a shoe organizer labeled with their number. They kids had no idea that it was a shoe organizer. As I was helping someone tie their shoes the first day we had the shoe organizer up, I had a student who was absent (when I explained the system) come up and ask where they put their Eagle Feather. I kept saying "In the shoe organizer." They put it in their shoe. It stayed there a good part of the morning until I noticed. We trade our Eagle Feathers in for coupons we got here. The kids love the coupon system. 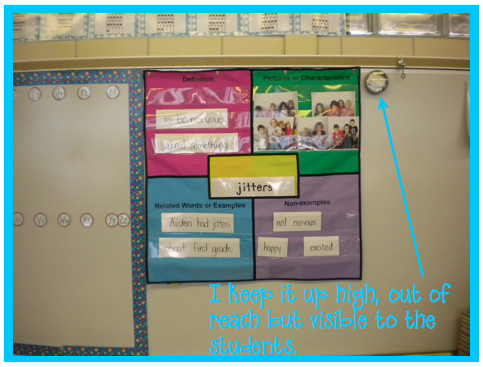 Then I stick it in a magnetic container and put it at the top of the board. There is also a little glitter in there for good measure. At the end of the day, I get it out and pull out the name. If that student had a good day, they get to keep the note to take home to mom and dad. They also get something out of my little prize box. If the student didn't have such a good day, I don't call them out. I just put it in my pocket and explain that whoever it was didn't have a very good day and maybe they will have a better day tomorrow. If you want a free copy of the Star Student cards you can get it here! What a cool idea! Thanks! And, I am your newest follower...so happy to have found your darling blog! I followed Judith's link and read about your idea. How fabulous! Could I bother you and also have a copy with the word "behaviour" instead? SUPER CUTE!! I seriously might have to start using this with my 5th graders!! Thanks for the idea and thanks for linking up with us!! I love this idea. I saw something similar somewhere else but your's is so much cuter. 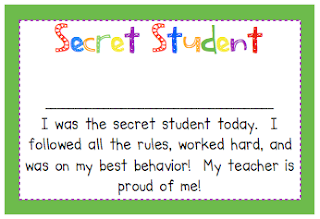 Is there any chance I could get an editable version because I teach in Canada and we spell "behaviour" differently. Thanks! I LOVE this idea!!!! I used something similar, but only for the hallway. I love the idea of having one student all day. Where did you get the container that you use to put the note in? I love that and would love to get one! Thanks! I'm a new follower! Can't wait to find all the goodies you must have on your blog! WHERE did you get that vocabulary pocket chart? I NEED it! Would I be able to have a copy with behaviour instead! Perfect for my y7s! Love this! Thanks for sharing! 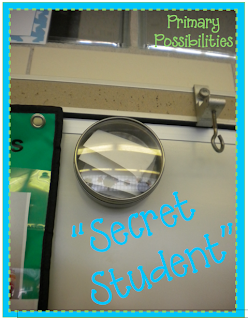 Where did you get your magnetic container? I also love this. Thanks for sharing!! Could you please tell me where you purchased the magnetic, see-through container? Thanks! شركة المنزل هى شركة تنظيف خزانات بجدة لدينا العمالة المدربة التى تقوم بخدمات تنظيف الخزانات بجدة بأستخدام اجود انواع المساحيق المستوردة التى تقضى على الشوائب والاتربة التى تتواجد فى قاع الخزانات كما ان جميع المنظفات المستخدمة فى تنظيف الخزانات بجدة مواد مستوردة لا تتفاعل كيميائيا مع المواد التى يتكون منها الخزانات بجدة ونحن نقدم جميع خدمات تنظيف الخزانات بجدة بأسرع وقت كما ان لدينا خدمات غسيل الخزانات بجدة وعزل الخزانات بجدة وجميع خدماتنا نقدمها لكم بأرخص الاسعار . عزيزي العميل ترحب بك شركة تنظيف بالمدينة المنورة التي تتيح لك أفضل ما يمكن أن تقدمه من خدمات نظافة عامة بالمدينة المنورة، فمن المعروف أن ربات البيوت تواجههن بعض الصعوبات في عملية تنظيف بعض الأغراض مثل تنظيف السجاد والمنازل و أيضاً تنظيف الكنب، كما يعاني البعض منهن من عملية تنظيف الستائر حيث تحتاج إلى متخصص في فك و إعادة تركيب الستائر، كما يتطلب تنظيف الكنب ماكينة بالبخار التي تستعمل في تنظيف المفروشات و كيها، لذا فقد قمنا نحن شركة تنظيف بالمدينة المنورة بتوفير المعدات المتطورة و العمالة الماهرة التي سوف تعمل بها، كل هذا بخبرة عالية و بسعر مناسب لكل العملاء.